A profiterole (pronounced pruh-FIHT-uh-rohl, but I like to say "olé" at the end for flair) has its own fairly strict definition that's not to be confused with cream puffs. 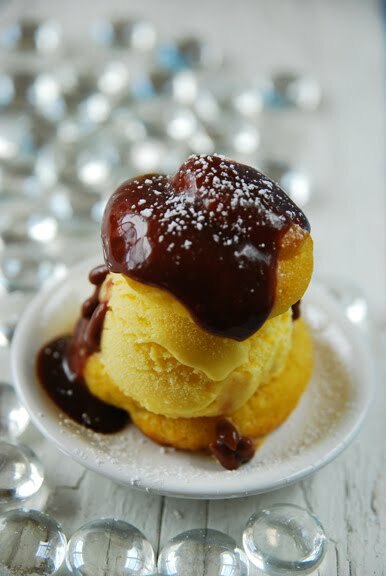 You must scoop vanilla ice cream (not whipped or pastry cream) inside a delicate puff of choux pastry (pâte à choux to be French about it) and drizzle the concoction with chocolate sauce (not sprinkle it with icing sugar as I did because it looks so pretty!). And don't try to call a savory choux pastry a profiterole! 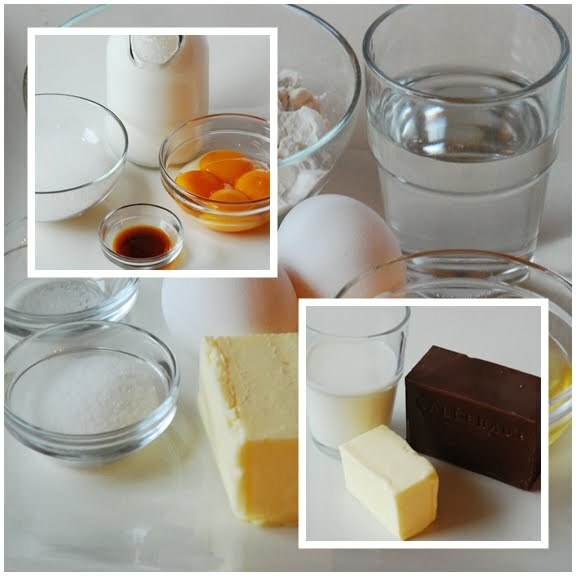 Profiteroles are quite simple to make, if you know how to make choux pastry! Getting the consistency of the choux pastry just right is tricky. Choux pastry is cooked twice, once on the stove and once in the oven. First, you cook the water, butter, sugar and salt on the stove until it comes to a boil. Then, add the flour all at once and cook over low heat until the dough pulls away from the sides and bottom of the pan. This is the tricky part. How long do you cook this mixture? How "dry" do you let the dough get? Then, if you've figured that out, you whisk in the eggs off the heat, one at a time, until the mixture is light and airy, not runny, and the dough is "just right"! Here is where practice, practice, practice comes in. The size of your eggs, the type of flour used and how dry the dough is make a difference. Too many eggs, and your puffs will be flat. Not enough eggs, and your puffs will be tough. The dough should be glossy and stiff enough to pipe. Got that? Pipe the dough into rounds and brush with egg glaze before baking at 425°F for 15 minutes and then at 350°F until they're browned, about 10 minutes. 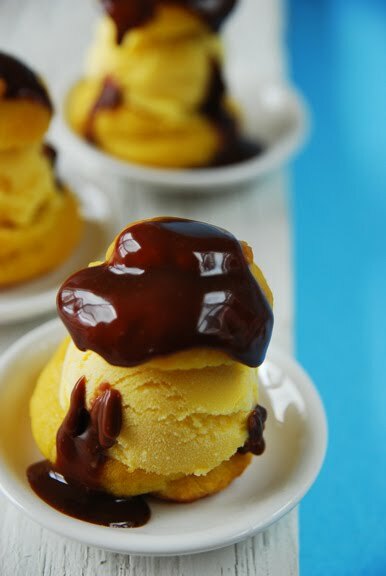 Once you've mastered choux pastry, vanilla ice cream and chocolate sauce are easy peasy lemon squeezy. You can find the recipe for Profiteroles au Chocolat (Profiteroles with Vanilla Ice Cream and Hot Chocolate Sauce) in the book Le Cordon Bleu at Home. To see how the rest of the Whisk Wednesdays group fared with their recipe, click here (or check out the sidebar) and then click on each blogger! These profiteroles tasted spectacular! The choux pastry was tender and delicious while also providing protection for the cold ice cream from the hot chocolate sauce. The chocolate sauce, for such a simple recipe, offered the perfect balance of bitter and sweet. This recipe was a huge hit with my family and I encourage you to try it, even though it's deceivingly challenging. Girl: I went to this awesome Italian restaurant last night. Boy: Oh, yeah? What did you have? Boy: That's 'Profiterole,' you dumbass. 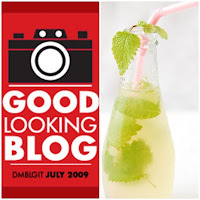 I am so pleased to have won a DMBLGIT (Does My Blog Look Good in This) award for July 2009. It was hosted by Jeanne of Cook Sister! and judged by Jeanne and some other amazing bloggers: Bron of Bron Marshall, Ilva of Lucullian Delights, Juno of Scrumptious Blog and Andrew of SpittoonExtra. Check out all the winners and entries here. I am honored to be in the company of such amazing food bloggers and photographers. Cheers! Yesterday, I received a call from Norman Fetterley of CTV News who will be interviewing me today at my home for a segment about Julie and Julia, Le Cordon Bleu and food blogging. To prepare for the segment, I decided to throw together cream puffs! So here I am at 11:00 p.m. enjoying a tasting! thanks for the demystification. I like the multiple versions of cooking. I am intrigued by "pre-cooking" elements before they are brought together. For wonton dough you mix flour with boiling water. wow! they look incredible. maybe someday I'll have the courage to make them! oh my shari you are a tease. i love profiteroles and this is taking the classic one notch up! Congrats on the award, Syrie!!! They look so cute and delicious!! Congrats on the CTV mention!! I hope I can catch it. I love profiteroles and dug up my dad's choux recipe to make them. Thanks for sharing your yummy ones! These look beautiful! Profiteroles are one of my favourite desserts ever. Beautiful profiteroles. It's so true that once you get the hang of choux pastry, you can do fabulous things with it... like make these!! Congrats on the award! I would think that you would win just about every month! oh my. these look really good, and esp. because they have ice cream in them and it is sweltering here! i love profiteroles, but after a disappointment at a restaurant this year (stale profiteroles + uninspiring sauce/cream) they dropped from my top ten list. Making them at home might re-instate then! ooh pretty! That chocolate sauce is so shiny! Congratulations on the great publicity. How exciting! I love making choux, and your profiterols look fantastic. Shari! Those are lovely!! 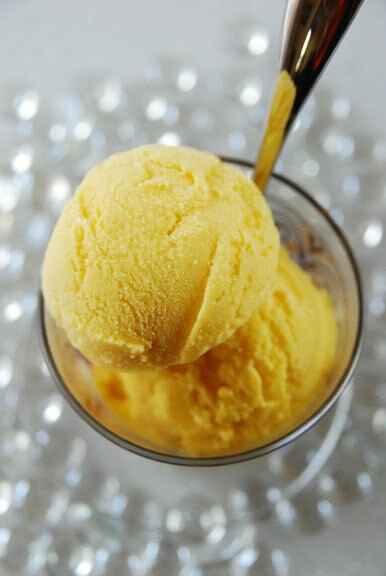 What gorgeous color on that ice cream! WOW! Where did you get the eggs?? Free Range? Congrats on your recent honors...we know they are most definitely well earned and deserved! Bravo!! I love the color of your vanilla ice cream. How was/is it? YUM. I've been wanting to make profiteroles. They look great! Beautiful photos. I've been making a lot of choux paste lately and it's been turning out wonderfully despite my being convinced I know not what I'm doing. I beat the dough with a mixer and once it's glossy and stringy it's good to go. Wow how impressive! These look divine! aww pretty pretty! I have to try making these one day! It kills me because that just looks sooo good Shari! Those are beautiful. And love what you did with them. I never can get mine to come out. But practice, practice, practice. very much! ( so cute you called it that LOL) .. never tried to make it ever.. but once I ate around 8 pieces when I was at a cafe in London.. my stomache was so upset! I was so Happy! Total yum! Congrats on the award and the TV appearance. Hope your vacation was lovely. how gorgeous! i love coming over here and drooling over your photos! I don't think you understand... you are my HERO right now! This is one of my favorite treats but I've never attempted at home. Thanks so much! Beautiful photos by the way... great blog! Congrats on the interview! Fantastic. Love this post, such fun. You have the most amazing posts. And all the pics and tips. I have learned so much from reading them. This one is no exception. These look beautiful! I love your blog. It's beautiful! That is making me crazy! Vanilla with chocolate sauce is my favourite icecream. Every New Year , I try something new in my kitchen. I wanted to try something new for this time too to treat my family and friends with. This will be a real treat! Just to clear up a few inaccuracies for readers. The use of ice cream as a filler is actually a North Americanism; it's not traditional. Re: "And don't try to call a savory choux pastry a profiterole!" Larousse Gastronomique disagrees with you, and invites you even to use a game purée as a filling. You see, profiterole is not a dish -- it refers to the baked pastry shell, regardless of the filling.